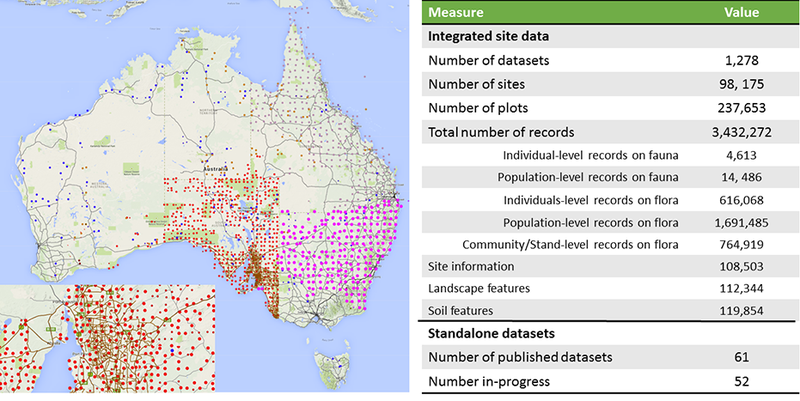 ӔKOS is a resource for researchers, educators and land managers. The repository presently contains very large data collections of integrated site data and small individual standalone datasets from researchers and mostly government land management agencies. New integrated data especially from the 'data collection' facilities within TERN is always being mapped and integrated to expand our holdings. There are notable gaps (some States and territories are under represented, a start has been made with animal data but more needs to be published) and as resources increase we anticipate these themes will expand. 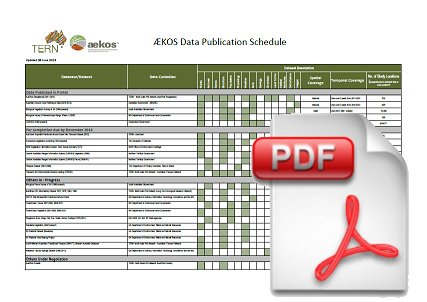 More details about the AEKOS resource is provided in the PDF. AEKOS has national coverage and deep temporal depth. For example, the Koonamore photopoint data has been collected since 1926, making it the oldest monitoring dataset in Australia. Summary details of the AEKOS resource show its enormous capacity to enable researchers, environmental managers and educators to use ecology data for national and global analysis and reporting.